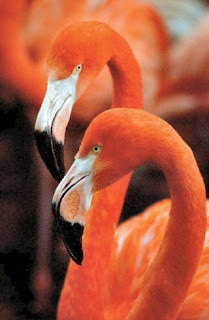 Carlos and Fernando, a gay flamingo couple at the Wildfowl and Wetlands Trust (WWT) in Slimbridge, England, have been trying to adopt for years. The pair, who have been committed for 6 years, have been known to chase other flamingos away from their nests so that they could have their eggs. Unfortunately, it appeared that the couple would remain childless until a twist of fate brought Carlos and Fernando the family they have dreamed of. Last week, caretakers at WWT found an abandoned egg and decided to give the pair a shot at fatherhood. Before the team had a chance to give the egg to the couple, it hatched in an incubator. Since flamingo parents usually bond with their chicks as they "talk them through" the process of hatching, the staff carefully taped the chick back inside the egg and brought it to Carlos and Fernando's nest. A short while later, the proud parents were seen "talking" to the chick inside the egg, and then helping it hatch for a second time. So far things seem to be going well and we wish the family the best of luck as they start their new life together! This is the third commentary on gays and parenthood I've heard/read today and it's not even 9am yet. This is the first positive one. Thanks for sharing and congratulations to Carlos and Fernando! Maybe they should arrange a playdate with the New York penguin couple. I like this story a lot. All the best to Carlos & Fernando!